Calling all young professionals … Make new friends while you make a difference! 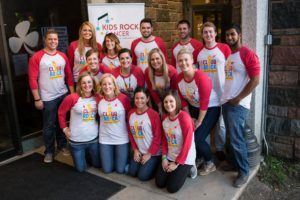 Club Rock is the Young Professionals advisory board of Kids Rock Cancer, Maryville University’s one-of-a-kind music therapy program for kids and teens whose lives have been rocked by cancer. Kids Rock Cancer provides therapeutic songwriting sessions for kids battling cancer and other blood disorders — or kids whose parent or sibling has been diagnosed. Sessions take place at cancer treatment and support centers all around St. Louis. During a session, kids work with a music therapist to write and compose their own song. Then they put on the headphones and sing their heart out — the song is recorded on a CD for them to keep and take home. Voila! They’re a rock star! Click here to view photos from our Club Rock events. There is no mandatory time commitment, but we hope you’ll attend meetings as often as possible. The Club Rock committee meets four times a year in the evening at a central location in St. Louis. Meetings are casual and relaxed, with time to enjoy food, drinks and conversation … and the chance to learn what’s new with Kids Rock Cancer. It’s also the time to plan fun new events and sign up to volunteer. We suggest a tax-deductible donation of $25-50 each year to support Kids Rock Cancer. Donations of varying amounts are also requested at events; however, most include complimentary appetizers and drinks. I’m not a musician. How can I help? Our highly-trained, certified music therapists provide the sessions, but you can help keep the music playing. Simply join Club Rock and help us plan monthly events for other young professionals in St. Louis. Or lend an extra pair of hands at Kids Rock Cancer events that take place throughout the year. Can I attend an event before I join? Absolutely — bring your friends too! Check out Kids Rock Cancer’s Facebook page to stay up to date on upcoming events. We look forward to seeing you! Contact Brittany Brown at BBRown5@maryville.edu or 314.529.9631. Sara first got involved with Kids Rock Cancer through her work at SSM Health Cardinal Glennon, one of KRC’s earliest partner sites. 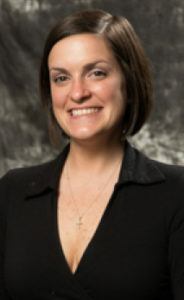 In her free time, Sara enjoys working out and spending time with her three dogs, family and friends. 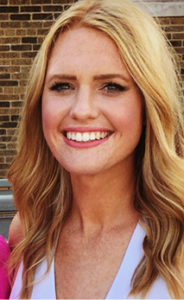 She is a huge animal lover and sits on the Steering Committee and Women’s Leadership Counsel at the Humane Society of Missouri. She also regularly visits nursing homes and schools with her dog Mishka to provide pet therapy through the APA’s PetReach program. Hannah first learned about Kids Rock Cancer after spending some time working on Maryville’s campus, and was really impressed by the university staff’s passion for the program. Their passion was contagious, Hannah says, and she was eager to get involved. When not working or volunteering for Kids Rock Cancer, Hannah enjoys coaching youth volleyball for the Rockwood Thunder Volleyball Club, playing sand volleyball, and spending time with family and friends! Who’s already in the Club? These Club Rock members are already making a difference!